The work of Andrew Lloyd Webber, who turns 70 this year, will be celebrated at a special musical event this Summer, with performers including Tyrone Huntley and the West End casts of School Of Rock – The Musical and The Phantom Of The Opera. Also set to perform at the event are talent show winners and actors Ben Forster and Joe McElderry, Irish singer/songwriter Imelda May, and actress and singer Mica Paris. Further star names are to be announced, all accompanied by The Royal Philharmonic Concert Orchestra, and the evening will culminate in a spectacular firework display. Audiences can expect to hear showstopper songs from a variety of musicals in Andrew’s world-famous repertoire, including Cats, Jesus Christ Superstar, Joseph And The Amazing Technicolor Dreamcoat, Evita, and Starlight Express. 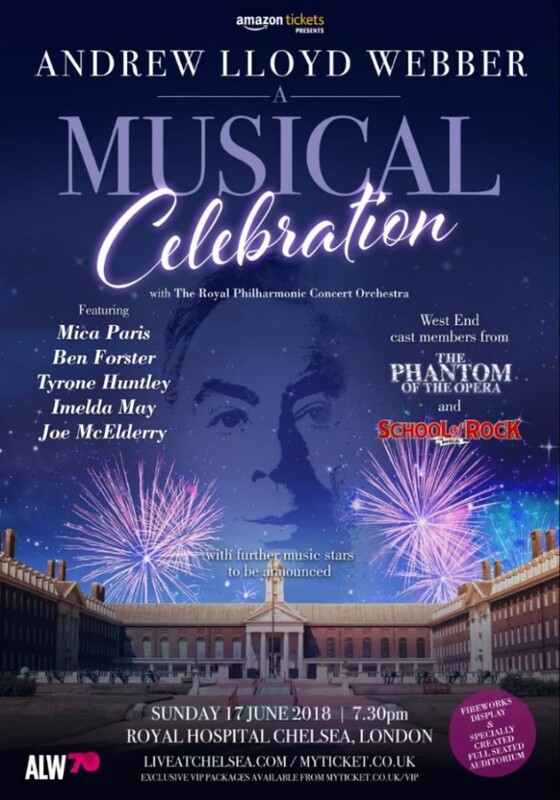 As part of the ongoing celebrations for his 70th birthday this year, Andrew Lloyd Webber – A Musical Celebration will take place on Sunday 17 June at the Royal Hospital Chelsea. The most successful musical theatre composer in history, Andrew’s productions have sold more than 330 million tickets worldwide, being seen in more than 80 countries around the world. When Sunset Boulevard joined School of Rock, Cats and The Phantom Of The Opera on Broadway last year, he became the only person to equal the record set in 1953 by Rodgers and Hammerstein, with four Broadway shows running concurrently, and he has claimed a multitude of awards, including seven Tonys, three Grammys, seven Oliviers, one Golden Globe and an Oscar. Andrew also owns seven West End theatres, including the Theatre Royal Drury Lane and the London Palladium, and last year acquired The Other Palace, which he has established as a unique London home for new musicals in development and fledgling writing talent. Tickets for the A Musical Celebration go on sale at 10am on Friday 23 February through the Live At Chelsea website. Join in the celebration of Andrew Lloyd Webber’s work – see The Phantom Of The Opera or School Of Rock – The Musical!